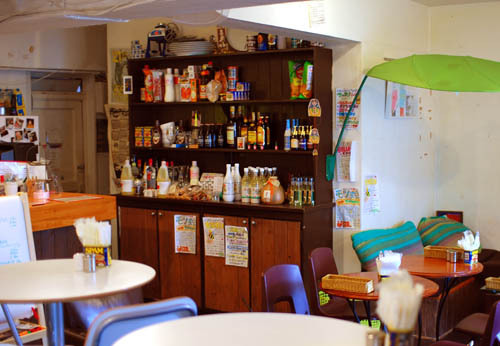 Billing themselves as an "avocado cafe," this sprawling, comfortable space is filled with mismatched furniture and charmingly primitive artwork (or perhaps projects from a kindergarten art class). Eating utensils are nestled in empty Spam cans. We nearly tripped over a big shaggy dog asleep just inside the entrance. A DJ setup stands ready for the cafe's regular music nights and occasional art events. The food menu focuses heavily on avocados - prize-winning guacamole, avocado fritters and numerous other avocado dishes in the evenings as well as daily pasta and risotto specials. At lunchtime there's a terrific Indonesian-style coconut and avocado curry, made with mushrooms and ground meat and seasoned on the spicy side. Take-out is available. Drinks include Belgian beers (all three colors of Chimay), coffee awamori and pear- and grape-flavored makkoli (milky Korean sake, for a limited time only). Budget around Y3000 at dinnertime.